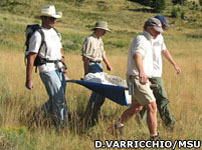 The fossil remains of small dinosaurs which burrowed into the ground were unearthed by scientists in Montana, USA, in 2007. The 95 million year-old bones were from an adult and two juveniles and were discovered in a chamber at the end of a 2.1m-long sediment-filled tunnel. The researchers said the discovery was the first definitive evidence that some dinosaurs dug dens and cared for their young in such structures. Details were reported in the journal, Proceedings of the Royal Society B. 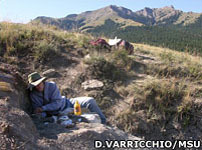 Burrowing also represented a mechanism by which small dinosaurs may have exploited the extreme environments of polar latitudes, deserts and high mountain areas, according to Dr David Varricchio and colleagues. The Montana dinosaurs had not previously been seen by palaeontologists. They were given the scientific name Oryctodromeus cubicularis, meaning 'digging runner of the lair'. The team said the species' snout, shoulder girdle, and pelvis had features one would expect to see in an animal that dug into the ground. Judging from the preserved vertebrae, the adult would have been about 2.1m long (6.8 feet) from nose to tail, with the major part of that (about 1.2m; 3.9 feet) being the tail itself. The estimated width of the animal fitted neatly with the size of the tube it was digging (about 30cm or one foot in diameter). What was left of the tunnel structure was sloping and had two sharp turns before ending in a chamber. The team stated that its architecture was similar to the dens of modern burrowers, such as the striped hyena, puffin, and some rodents. The dinosaur remains were covered in the coarse-grained sediment from an ancient flood; but Dr Varricchio, of Montana State University, said this did not explain the animals' deaths. The bones were disarticulated; they had been moved around after death. It was not as though they were sitting in their burrow and a flooding event filled the chamber with sediment, entombing them. They must have died, undergone decay, and then the burrow was filled. Commenting on the discovery, Professor Kevin Padian from the Museum of Palaeontology, University of California-Berkeley, said the Montana team should be commended for the detailed way in which it went about its work. Many would have missed the significance of the tunnel. This discovery was, first and foremost, a testament to the value of keeping one's eyes open in the field and noticing everything, and it took a special group of scientists to realise the meaning of the discovery that they made, according to Professor Padian. However, he bemoaned the impact of commercial fossil hunting which, he claimed, sought to get specimens out of the ground as fast as possible, often destroying valuable scientific information in the process.